These are the results of the latest poll conducted by the Palestinian Center for Policy and Survey Research (PSR) in the West Bank and the Gaza Strip between 3-6 December 2014. The period before the poll witnessed increased tension in al Haram al Sharif (Noble Sanctuary, known to Israeli Jews as the Temple Mount) and the Jerusalem area leading to repeated clashes and various knife and other attacks. The period also witnessed continued stalemate in the implementation of the Fatah-Hamas reconciliation agreement. 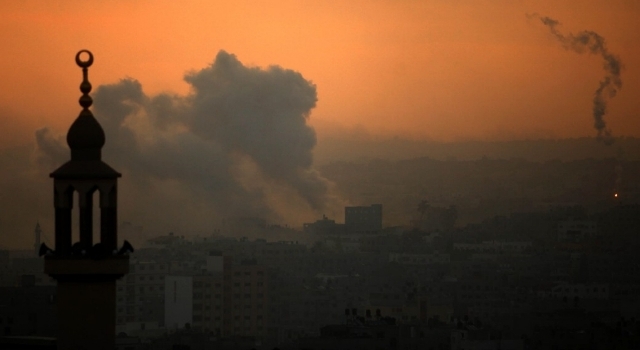 But the ceasefire agreement between Hamas and Israel remained in effect with both sides observing it. Palestinian efforts to secure international support for statehood recognition gained an added momentum while Israeli-Palestinian violence continued to rise. Domestically, the PA arrested and then released the head of the union of public sector employees while declaring the union illegal. This press release covers public perception of domestic developments such as reconciliation, elections, and balance of power. It also covers aspects of the Gaza War, the peace process, and a permanent peace agreement. Total size of the sample is 1270 adults interviewed face to face in 127 randomly selected locations. Margin of error is 3%. Four months after the end of the latest Gaza war, the initial findings are still strongly felt. Despite a relative improvement in the balance of power in favor of Abbas and Fatah, the popularity of Hamas and Ismail Haniyeh remains higher. Indeed, Hamas can easily win a new presidential election if one is held today. Hamas can also do better than Fatah in a new parliamentary election. Optimism regarding the chances for a successful implementation of the reconciliation agreement between Fatah and Hamas continues to diminish. Similarly, satisfaction with the performance of the reconciliation government and the performance of President Abbas continues to drop. Despite the fact that most of the public does have much confidence in the union of the public sector employees, about two thirds view as unacceptable the steps taken by the PA government against the union and its head. Most Palestinians continue to believe that Hamas won the war. Morevoer, an overwhelming majority of Palestinians continues to support launching of rockets from the Gaza Strip if the blockade is not lifted. Findings also show that the level of support for a return to an armed intifada remains high; indeed support for armed struggle has increased compared to our previous findings three months ago particularly in light of the dangerous tension in Jerusalem and the holy places. The Palestinian public believes the worst regarding Israeli intentions and goals for al Haram al Sharif, the Nobel Sanctuary, and half of the public fears that Israel will succeed in achieving those goals. Perhaps driven by this fear, the overwhelming majority tends to support those acts of violence, such as knifing and run-over, that have become lately more frequent in Jerusalem. Along with this development, findings show a significant decline in the percentage of support for a permanent peace settlement along the lines of the Clinton Parameters and the Geneva Initiative. A decline has also been registered in the level of support for the two-state solution. Finally, we asked the public about its views on the group known as the Islamic State of Iraq and Syria (ISIS). Findings show that the overwhelming majority believes that the group does not represent true Islam. But the belief that it does represent true Islam was found twice as much in the Gaza Strip compared to the West Bank. Findings also show that the majority of the public, in both the West Bank and the Gaza Strip, supports the current war against ISIS. Half of the public believes that Israel will succeed in implementing its designs for al Haram. An overwhelming majority (87%) believes that al Haram al Sharif is in grave danger: 56% believe that Israel intends to destroy al Aqsa Mosque and the Dome of the Rock and replace them with a Jewish temple; 21% believe that it intends to divide the plateau on which the two mosques sit so that Jews would have a synagogue alongside the Muslim holy places; and 9% believe that Israel intends to change the status quo prevailing in the plateau since 1967 by allowing Jews to pray there. Only 6% believe that Israel is interested in maintaining the status quo without change. Moreover, half of the public believes that Israel will indeed succeed in implementing its plans for al Haram al Sharif. If new presidential elections are held today and only two were nominated, Ismail Haniyeh and Mahmoud Abbas, the former would win a majority of 53% (compared to 55% three months ago) and the latter 42% (compared to 38% three months ago). In the Gaza Strip, Abbas receives 44% and Haniyeh 54%. In the West Bank, Abbas receives 41% and Haniyeh 53%. In this regard, the evel of satisfaction with the performance of Abbas drops to 35% (compared to 39% three months ago). Satisfaction with Abbas stood at 50% before the Gaza war. Satisfaction with Abbas is higher in the West Bank (37%) compared to the Gaza Strip (32%), among those whose age is over 50 years (40%) compared to those whose age is between 18 and 28 years (30%), among Fatah supporters (84%) compared to supporters of Hamas , the undecided, those who do not intend to participate in elections, and supporters of third parties (9%, 25%, 25%, and 29% respectively), among supporters of the peace process (48%) compared to those who oppose the peace process (15%), among the illiterates (51%) compared to those with a BA degree (33%), among employees (38%) compared to students (29%), and among those who work in the public sector (40%) compared to those who work in the private sector (35%). If presidential elections were between Marwan Barghouti and Haniyeh, the former would receive 52% and the latter would receive 43% of the participants’ votes. Three months ago, Barghouti received 48% and Haniyeh 46%. Before the Gaza War Barghouti received the support of 58% and Haniyeh 38%. If presidential elections were between three: Mahmud Abbas, Marwan Barghouti and Ismail Haniyeh, Abbas would receive 24%, Barghouti 33%, and Haniyeh 40%. If new legislative elections were held today with the participation of all factions, 70% say they would participate in such elections. Of those who would participate, 36% say they would vote for Hamas and 34% say they would vote for Fatah, 11% would vote for all other third parties combined, and 20% are undecided. Three months ago, vote for Hamas stood at 39% and Fatah at 36%. Before the Gaza war vote for Hamas stood at 32% and Fatah 40%. Vote for Hamas in the Gaza Strip stands in this poll at 42% and for Fatah at 34%. In the West Bank vote for Hamas stands at 32% and Fatah at 33%. These findings indicate a drop in Hamas’ popularity in the West Bank compared to the findings three months ago when it stood at 38%. They also indicate a drop in support for Fatah in the Gaza Strip from 39% to 34% during the same period. In this context, a majority of 71% wants elections to take place within few to six months from today, 8% want them to take place after a year or more, and 16% do not want elections. Positive evaluation of conditions in the Gaza Strip stands at 10% and positive evaluation of conditions in the West Bank stands at 23%. Perception of safety and security rises in the Gaza Strip to 46% and drops in the West Bank to 38%. Viewership of al Aqsa TV station drops to 18%. Only 30% believe that people in the West Bank can criticize PA authorities without fear. About two thirds of West Bankers believe that the arrest of the head of the public sector employee union is unacceptable or illegitimate. Positive evaluation of conditions in the Gaza Strip stands at 10% and positive evaluation of conditions in the West Bank stands at 23%. Yet, perception of safety and security in the Gaza Strip increase from 31% three months ago to 46% in this poll. Six months ago, before the Gaza war, the percentage of safety and security in the Gaza Strip stood at 64%. In the West Bank perception of safety and security drops from 47% three months ago to 38% in this poll; three months ago, it stood at 51%. But despite the improved security in the Gaza Strip, findings show that the percentage of Gazans who say they seek immigration to other countries stands at 43%; in the West Bank, the percentage stands at 23%. Viewership of Hamas TV, al Aqsa, drops from 24% three months ago to 18% in this poll. Al Jazeera viewership rises from 24% to 26%, Palestine TV from 20% to 22%, Maan-Mix from 12% to 13%, and al Arabiyya from 7% to 8%. Perception of corruption in PA institutions stands at 81% compared to 78% three months ago. Moreover, only 21% say there is press freedom in the West Bank and 20% say the same about the status of the press in the Gaza Strip. Similarly, 30% of the Palestinian public say people in the West Bank can criticize the authority in the West Bank without fear. By contrast, a larger percentage of 34% say people in the Gaza Strip can criticize the authorities in Gaza without fear. In the West Bank, 33% say they believe the union of the West Bank public sector employees works first and foremost for the benefit of the employees while 51% believe it only serves political and partisan agenda. Despite this lack of trust in the union, 65% of West Bankers consider the arrest of the head of the union, Bassam Zakarnah, and his deputy unacceptable or illegal while only 16% consider it acceptable or legal. In the Gaza Strip, 49% believe the union of the Gazan public sector employees works first and foremost for the benefit of the employees while 47% believe it serves political and partisan agenda. Nonetheless, 70% of Gazans consider the arrest of Zakarnah and his deputy to be unacceptable or illegal. The belief that the arrest is unacceptable or illegal increases also among men (69%) compared to women (65%), among those whose age is over 50 years (71%) compared to those whose age is between 18 and 28 years (66%), among supporters of Hamas and third parties (81% and 76% respectively) compared to Fatah supporters, those who do not intend to participate in elections and the undecided (58%, 61% and 64% respectively), among the religious (70%) compared to the somewhat religious (65%), among those who oppose the peace process (80%) compared to those who support the peace process (62%), among the holders of BA degree (71%) compared to the illiterates (65%), and among merchants, farmers, and employees (75%, 73%, and 70% respectively) compared to students and laborers (63% each). Pessimism about reconciliation rises to 58%. Satisfaction with the performance of the reconciliation government drops to 26%. 44% believe that Hamas has a shadow government in the Gaza Strip, but only 21% blame Hamas for the bad performance of the reconciliation government. A majority of 55% believes that the PA is a burden on the Palestinian people. Optimism about the success of reconciliation and the end of the split drops from 53% three months ago to 40% in this poll. Pessimism rises from 43% to 58%. Moreover, satisfaction with the performance of the reconciliation government drops from 36% three months ago to 26% in this poll. Dissatisfaction rises from 54% to 67%. It is worth mentioning thatsix months ago, right after its establishment, 61% had confidence in the reconciliation government. 49% (61% in the Gaza Strip) want to place the reconciliation government in charge of the Rafah crossing, but 36% (26% in the Gaza Strip) prefer to keep it under Hamas’ control. The same applies to the crossings with Israel with 50% (58% in the Gaza Strip) wishing to place them under the control of the reconciliation government. 46% want the reconciliation government to be in charge of the reconstruction of the Gaza Strip and 35% want it placed in the hands of Hamas. Satisfaction with the implementation of the reconciliation agreement drops from 48% three months ago to 36% in this poll. 44% believe that Hamas has established a shadow government in the Gaza Strip and 41% reject this claim. But the belief that Hamas was responsible for hindering the functioning of the reconciliation government does not exceed 21% while 32% believe that the PA and president Abbas were to blame for that and 15% blame the head of the reconciliation government. Belief that Hamas is responsible for the poor performance of the reconciliation government is higher in the Gaza Strip (31% compared to the West Bank (14%), among men (24%) compared to women (18%), among Fatah supporters (46%) compared to supporters of Hamas (5%), among supporters of the peace process (26%) compared to those who oppose the peace process (11%), among employees (31%) compared to housewives (16%), among those working in the public sector (33%) compared to those working in the private sector (23%). In light of the dissatisfaction with the performance of the reconciliation government, 55% believe the PA has become a burden on the Palestinian people and only 40% believe it is an accomplishment. Six months ago, right after the formation of the reconciliation government, 50% said the PA was an accomplishment and 45% said it was a burden. The largest percentage (40%) believes that radical groups, not from Fatah or Hamas, were behind the explosions that targeted cars and homes of Fatah leaders in the Gaza Strip while 18% blame Fatah or groups within Fatah and 17% blame Hamas or groups within Hamas for these explosions. 10% blame others, most prominently Israel. Two thirds believe that Hamas won the Gaza war, but satisfaction with the accomplishment of the war drops to 42%. Majority continues to support launching rockets from Gaza if the siege and blockade are not lifted. Less than half of the respondents have heard about Abbas plan which seeks to set a deadline for ending occupation and 43% of those who have heard about it believes its chances of success are high or medium. 48% support the two-state solution but 58% believe that this solution is no longer practical due to settlement expansion; yet, 71% oppose the one-state solution. The largest percentage (42%) believes that armed action is the most effective means for establishing Palestinian state while 26% believe in negotiations and 28% believe in popular non violent action. 80% favor joining additional international organizations. 79% support Hamas’ way of confronting Israeli occupation and only 28% support merging al Qassam Brigades in the Palestinian National Forces. 80% support attempts by individuals to stab or run over Israelis. 38% support and 60% oppose a package containing a permanent settlement along the lines of the Clinton Parameters and the Geneva Initiative, but 23% of those who oppose the package accept it if Israel accepted the Arab Peace Initiative. An overwhelming majority (82%) is worried that it will be hurt at the hands of the Israelis and a similar percentage (83%) thinks Israel’s long term aspiration is to annex Palestinian territories and expel its population or deny them their political rights. Belief that Hamas has won the Gaza War drops from 69% three months ago to 66% in this poll; 22% believe the two sides were losers. In the Gaza Strip, only 58% say Hamas came out a winner. Similarly, percentage of satisfaction with war achievements compared to the human and material losses sustained by the Gaza Strip drops from 49% a month ago to 42% in this poll. 56% are currently dissatisfied with the achievements. In the Gaza Strip, 66% are dissatisfied with war achievements. Despite that, an overwhelming majority of 77% supports the launching of rockets from the Gaza Strip at Israel if the siege and blockade are not ended. Similarly, a majority of 79% favors Hamas way of resisting occupation; this percentage stood at 81% three months ago. Support in the West Bank for Hamas’ way stands at 80% and in the Gaza Strip at 78%. Support for Hamas’ way rises to 98% among Hamas supporters compared to 62% among Fatah’s. Similarly, support increases among the religious (86%) compared to the somewhat religious (76%), among those who oppose the peace process (92%) compared to those who support the peace process (73%), and among holders of BA degree (79%) compared to the illiterates (56%). Furthermore, 62% favor the transfer of Hamas’ armed approach to the West Bank and 36% oppose that. Three months ago support for this transfer stood at 63%. Moreover, only 28% support the merging of Hamas’ al Qassam Brigades into the PA’s National Security Forces as a way of meeting the demand for disarming Hamas and 68% oppose that. Additionally, support for the proposal to dissolve Gazan armed groups stands at 47%. But the support is conditional: 19% support it only after reaching a peace agreement, 15% support it only after the removal of the siege and blockade, and 6% support it after the holding of elections. 8% support dissolving armed groups now without any conditions. Opposition to disarming Gazan armed groups stands at 49%. In the Gaza Strip opposition to disarming these groups stands at 45%. 48% support and 51% oppose the two-state solution. But 58% say that the two-state solution is no longer practical due to Israeli settlement expansion and 38% think it is still practical. Similarly, 70% believe that the chances for establishing a Palestinian state next to the state of Israel in the next five years are slim or non-existent. Despite that, only 28% support and 71% oppose the abandonment of the two-state solution and the adoption of the one-state solution. The public is divided over the most effective means of ending occupation and building a Palestinian state: 42% believe that armed confrontation is the most effective means; 26% believe negotiation is the best means, and 28% believe that popular non-violent resistance is the most effective route to statehood. Three months ago, 44% said armed confrontations were the most effective means while 29% selected negotiations, and 23% selected popular non-violent resistance. Percentage of those who believe that armed action is the most effective means of establishing a Palestinian state alongside Israel increases in the Gaza Strip (45%) compared to the West Bank (40%), among men (45%) compared to women (39%), among those whose age is between 18 and 28 years (45%) compared to those whose age is over 50 years (42%), among Hamas supporters and the undecided (66% and 48% respectively) compared to supporters of Fatah and third parties (21% and 34% respectively), among the religious (45%) compared to the somewhat religious (39%), among those who oppose the peace process (71%) compared to those who support the peace process (30%), among holders of BA degree (51%) compared to the illiterates (21%), and among students (50%) compared to housewives (37%). In the absence of viable negotiations, 80% support joining more international organizations; 73% support joining the International Criminal Court; and 60% favor resort to popular non-violent resistance; 56% support return to an armed intifada, and 49% support dissolving the PA. Three months ago, support for a return to armed intifada stood at 50% and six months ago at 41%. Findings also show that only 46% of the public has heard about President Abbas’ plan to set a deadline for ending occupation and building a state. Among those who have heard about the plan 69% support it and 28% oppose it. Only 43% of those who have heard about the plan believe the chances for its success were medium or high and 56% believe its chances for success were low or non-existent. Findings also show that in light of the tension in East Jerusalem and the increase in the level of mutual violence, 79% support and 20% oppose attempts by individual Palestinians to stab or run over Israelis in Jerusalem and the rest of the West Bank. Findings show that 38% support and 60% oppose a package of a permanent status agreement based on the Clinton Parameters and the Geneva Initiative. Support for this package stood at 46% in December 2013. The Clinton parameters for a Palestinian-Israeli permanent settlement were presented by President Clinton at a meeting with Israeli and Palestinian officials almost ten years ago, on December 23, 2000, following the collapse of the July 2000 Camp David summit. The Geneva Initiative, along similar lines, was made public around the end of 2003. These parameters address the most fundamental issues which underlie the Palestinian-Israeli conflict: (1) final borders and territorial exchange; (2) refugees; (3) Jerusalem; (4) a demilitarized Palestinian state; (5) security arrangements; and (6) end of conflict. We have been addressing these issues periodically since December 2003, and in the current poll we revisited these crucial issues following the most recent Gaza War. (1) Final Borders and Territorial Exchange: 45% support or strongly support and 54% oppose or strongly oppose an Israeli withdrawal from the West Bank and the Gaza Strip with the exception of some settlement areas in less than 3% of the West Bank that would be swapped with an equal amount of territory from Israel in accordance with a map that was presented to the Palestinian respondents. The map was identical to that presented to respondents in December 2013, when support for this compromise, with its map, stood at 52% and opposition at 48%. (2) Refugees: 40% support and 58% oppose a refugee settlement in which both sides agree that the solution will be based on UN resolutions 194 and 242. The refugees would be given five choices for permanent residency. These are: the Palestinian state and the Israeli areas transferred to the Palestinian state in the territorial exchange mentioned above; no restrictions would be imposed on refugee return to these two areas. Residency in the other three areas (in host countries, third countries, and Israel) would be subject to the decision of these states. As a base for its decision Israel will consider the average number of refugees admitted to third countries like Australia, Canada, Europe, and others. All refugees would be entitled to compensation for their “refugeehood” and loss of property. In December 2013, 46% agreed with an identical compromise while 52% opposed it. (3) Jerusalem: 29% support and 71% oppose a Jerusalem compromise in which East Jerusalem would become the capital of the Palestinian state with Arab neighborhoods coming under Palestinian sovereignty and Jewish neighborhoods coming under Israeli sovereignty. The Old City (including al Haram al Sharif) would come under Palestinian sovereignty with the exception of the Jewish Quarter and the Wailing Wall that would come under Israeli sovereignty. In December 2013, an identical compromise obtained 32% support and 68% opposition. (4) Demilitarized Palestinian State: 28% support and 71% oppose the establishment of an independent Palestinian state that would have no army, but would have a strong security force and would have a multinational force deployed in it to ensure its security and safety. Israel and Palestine would be committed to end all forms of violence directed against each other. A similar compromise received in December 2013, 28% support, and opposition reached 71%. (5) Security Arrangements: 46% support and 53% oppose a compromise whereby the Palestinian state would have sovereignty over its land, water, and airspace, but Israel would have the right to use the Palestinian airspace for training purposes, and would maintain two early warning stations in the West Bank for 15 years. A multinational force would remain in the Palestinian state and in its border crossings for an indefinite period of time. The task of the multinational force would be to monitor the implementation of the agreement, and to monitor territorial borders and coast of the Palestinian state including the presence at its international crossings. In December 2013, 52% of the Palestinians supported this parameter while 48% opposed it. (6) End of Conflict: 61% support and 37% oppose a compromise on ending the conflict that would state that when the permanent status agreement is fully implemented, it will mean the end of the conflict and no further claims will be made by either side. The parties will recognize Palestine and Israel as the homelands of their respective peoples. The comparable figures in December 2013 were 63% support and 36% opposition. If president Abbas presented this package to the public in a referendum, 38% say they would vote in favor and 58% say they would vote against it. If the package contained an Israeli acceptable of the Arab Peace Initiative, 23% of those who oppose the package would change their mind and vote in favor. Support for the package increases in the Gaza Strip (43%) compared to the West Bank (35%), among supporters of Fatah and third parties (62% and 49% respectively) compared to supporters of Hamas and the undecided (19% and 30% respectively), among the somewhat religious (41%) compared to the religious (33%), among supporters of the peace process (47%) compared to those who are opposed to the peace process (20%), among the illiterates (49%) compared to holders of BA degree (34%), among employees, laborers and housewives (44%, 41%, and 40% respectively) compared to students (27%), and among those working in the public sector (46%) compared to those working in the private sector (37%). Findings show that the overwhelming majority of the public (82%) are worried and 19% are not worried that they or members of their families would be hurt by Israelis or their land confiscated or homes demolished. Moreover, 83% believe that Israel’s long term goal is to expand its borders to include all territories between the Jordan River and the Mediterranean Sea and expel their Palestinian population or deny them their political rights. When asked about the long term goal of the PLO and the PA, 69% said that it is to recover all or some of the Palestinian territories occupied in 1967 and 25% said it is to defeat Israel and recover the 1948 territories or defeat Israel and destroy its Jewish population. 43% believe that that the first most vital Palestinian goal should be end of Israeli occupation and building a Palestinian state. 29% believe that the continuation of occupation and settlements is the most serious problem confronting Palestinian society today and 25% believe it is the spread of corruption. 43% believe that the first most vital Palestinian goal should be to end Israeli occupation in the areas occupied in 1967 and build a Palestinian state in the West Bank and the Gaza Strip with East Jerusalem as its capital. By contrast, 31% believe the first most vital goal should be to obtain the right of return of refugees to their 1948 towns and villages, 16% believe that it should be to build a pious or moral individual and a religious society, one that applies all Islamic teachings, and 9% believe that the first and most vital goal should be to establish a democratic political system that respects freedoms and rights of Palestinians. The most serious problem confronting Palestinian society today is the continuation of occupation and settlement activities in the eyes of 29% of the public, while 25% say it is the spread of corruption in some public institutions; 23% say it is poverty and unemployment; and 18% believe it is the siege of the Gaza Strip and the closure of its crossings. Three quarters views ISIS as a radical fringe that does not represent true Islam and 12% view it as representing true Islam. Among those who view ISIS as not representing true Islam, 74% support the current war against it. Among those who view ISIS as representing true Islam, 61% believes that a group loyal to it should be established in Palestine. Three quarters of the public believe that ISIS is a radical group that does not represent true Islam and 12% believe it does represent true Islam. 14% are not sure or do not know. In the Gaza Strip, 19% (compared to 8% in the West Bank) say ISIS represents true Islam. 74% of those who say ISIS does not represent true Islam support, and 20% oppose, the war currently waged by Arab and West countries against the group. 61% of those who say ISIS represents true Islam believe that an Islamist movement loyal to the group should be established in the Palestinian territories; 36% of them oppose that. Belief that ISIS represents true Islam is higher among men (14%) compared to women (10%), among those whose age is between 18 and 28 years (15%) compared to those whose age is over 50 years (8%), among Hamas supporters (19%) compared to supporters of Fatah, the undecided and supporters of third parties (7%, 7%, and 10% respectively), among those who oppose the peace process (18%) compared to supporters of the peace process (7%), among refugees (15%) compared to non-refugees (9%), among holders of BA degree (15%) compared to illiterates (6%), among students and employees (20% and 17% respectively) compared to professionals and retirees (7% each).